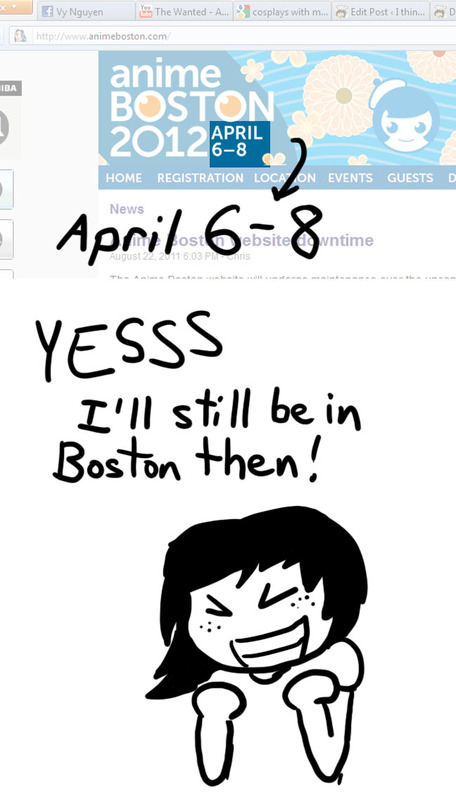 Anime Boston and PAX East overlap?! | I think in comics. I’ve only been to one anime convention in my life: Zenkaikon, located in the greater Philadelphia area. It’s not that big– 2011’s attendance was a mere 3,422 paid attendees. All the photos are ones I took from Zenkaikon 2011! Can you find me in the background? I crave greater nerd-fests. Since I’m going to be living in Boston, I naturally would like to go to the two huge conventions there: Anime Boston and PAX East (PAX standing for Penny Arcade Expo). Anime Boston, as you’d expect, is a convention themed around Japanese manga and anime. Last year hosted nearly 20,000 paid attendees. PAX East is the East-coast version of the original PAX (held in Seattle) that celebrates gaming culture. 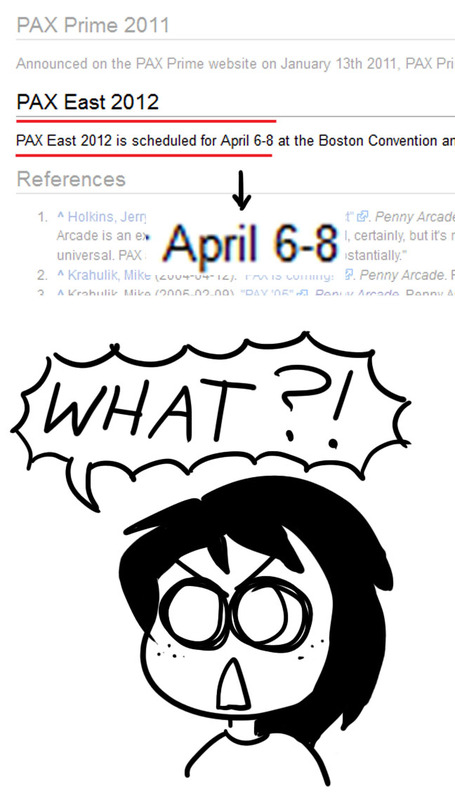 Founded by webcomic giants Jerry Holkins and Mike Krahulik (the author-writer team of the popular comic Penny Arcade) PAX East drew a whopping 69,500 guests– and let me tell you, this is huge. Two huge conventions in the same city, on the same day. Worst timing ever? I think so. There’s already been much consternation on gaming blogs and forums. 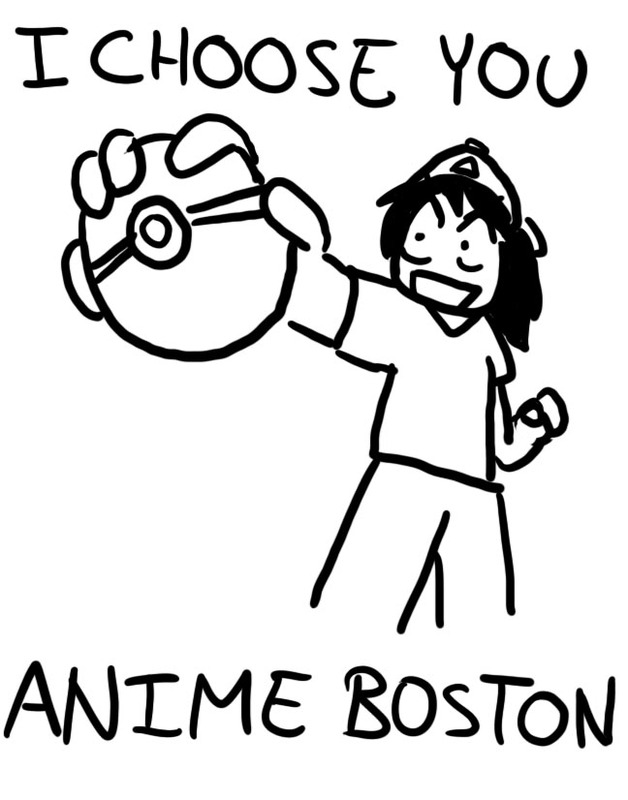 PAX East has the potential to draw away attendees of Anime Boston, as many comic fans also love games, and vice versa. This could be bad for Anime Boston– as a non-profit convention, Anime Boston is funded solely by the registration fees it collects each year. There will be those who buy tickets to both, of course, but not everyone (me) can afford all that for one weekend. So it could be a problem. Maybe there’s hope– Anime Boston and PAX East have made a deal to “work together in some fashion” (???) Which is good, since the two conventions have the potential to attract over 100,000 nerds, Boston’s gonna get crazy that weekend. As for which one I plan to attend? Wow, this drawing is bad enough to become an internet meme. Apologies, forshortening is obviously not my thing. I’ve always been more of a comic geek than a gamer chick (first-person-shooters, sadly, are not part of my skill set) and PAX East is guaranteed to be in Boston for 2013, so I’ll get another chance. If there’s overlap again in 2013, I’ll try to get into PAX. Hopefully, though, I won’t have to make that choice. Oh Vy, at least you’re lucky enough to go to something like that! I have… COWS!!! Aw yeah, be jealous! But, I’m sure they’d fix that; both conventions would benefit and all. And I want you to be able to go to both; then, you’d be the happiest little asian girl there ever was!! TAKE ME WITH YOU TO ANIME BOSTON SO WE CAN BE NERDS TOGETHER! I wish they could fix it, but to book a site for a convention that big takes months– even years– of wrestling and wrangling. It’s basically set in extreme stone. COME TO BOSTON SON THAT IS THE BEST IDEA EVER ANIME!!!!! I HATE IT WHEN EVENTS OVERLAP! It’s so terrible! You know, I can’t say for sure! 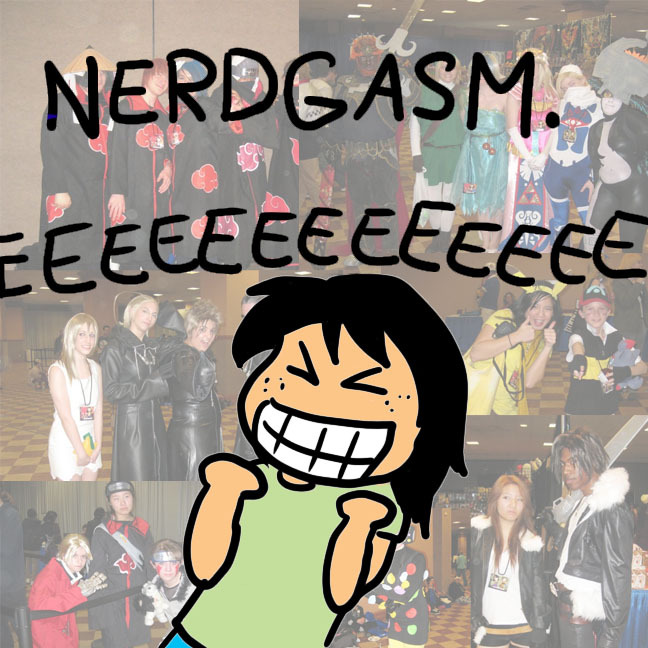 I’ve only ever been to one anime convention, a much smaller one in the Philadelphia area. There was a bunch of panels and presentations by voice actors, cartoonists, and other guests in addition to a large artists’ alley and vendor tables to shop for anime-related goods. I recall there being rooms for gaming and anime screenings. Thank you! You have fun at PAX! It seriously sounds AWESOME– next year, I swear I’ll go! Thanks 🙂 you have fun too! Pingback: Who needs sleep when there are games to be played? | I think in comics.